Historically the world of equestrian travel has contained an exciting mixture of unique men and women. Some are adventurers seeking danger from the back of their horses. Others are travellers discovering the beauties of the countryside they slowly ride through. A few are searching for inner truths while cantering across desolate parts of the planet. 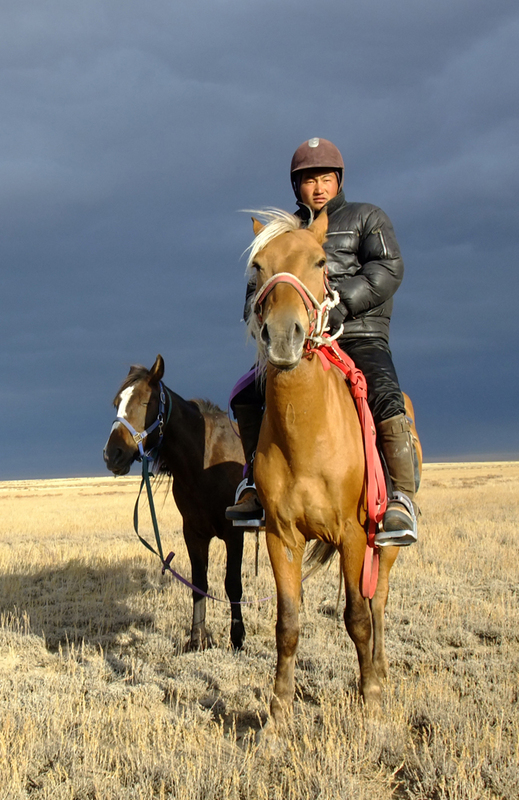 Canadian Long Rider Bonnie Folkins’ mission is to use her horse and camera to arrive at a deeper understanding of Central Asia’s remaining nomads. Though she has travelled and photographed in Italy, India, Australia and Latin America, the impassioned Long Rider has been repeatedly drawn back to the land of horses and free riders. Folkins first travelled to western Mongolia in February 2007, where she discovered a Kazakh minority living in the remote Altai Mountains. These were the descendants of nomads who had fled the cultural genocide unleashed in the 1930s by Soviet dictator, Josef Stalin. With an estimated two million people dead on the Kazakh steppes, the survivors sought refuge in Mongolia. When she ventured into this isolated corner of Mongolia, Folkins discovered the Kazakhs living in secluded homes. Not only were they still mounted, they had also retained their ancient tribal custom of hunting wolves in winter with the help of specially trained golden eagles. Click on picture to read an excellent article about Bonnie and the Eagle Hunters. It was written by Geoff Young and published in Horse Connection. 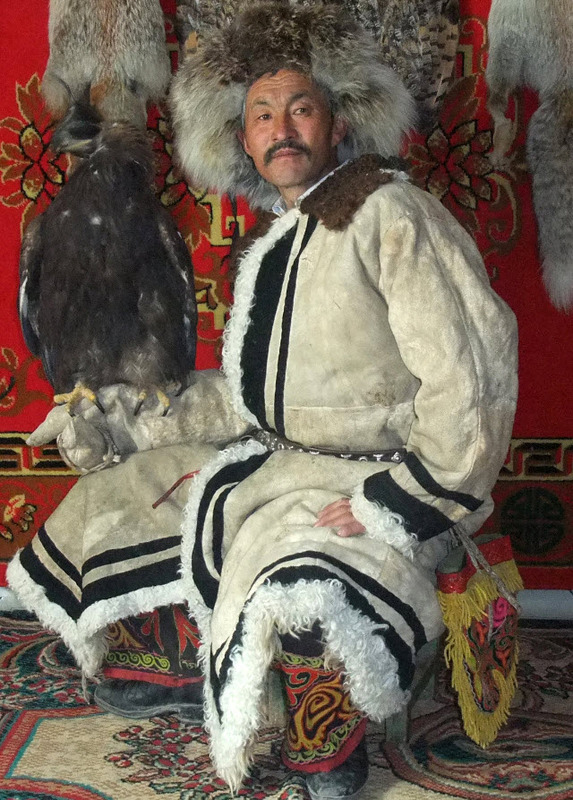 The Kazakh eagle hunter, Dalaikhan, is one of the nomads whom Long Rider photographer, Bonnie Folkins, has ridden with and photographed. “I was deeply inspired by the kindness and generosity of the Kazakh people and, because it was such a life-altering experience, I wanted to give something back” Folkins told the Guild. 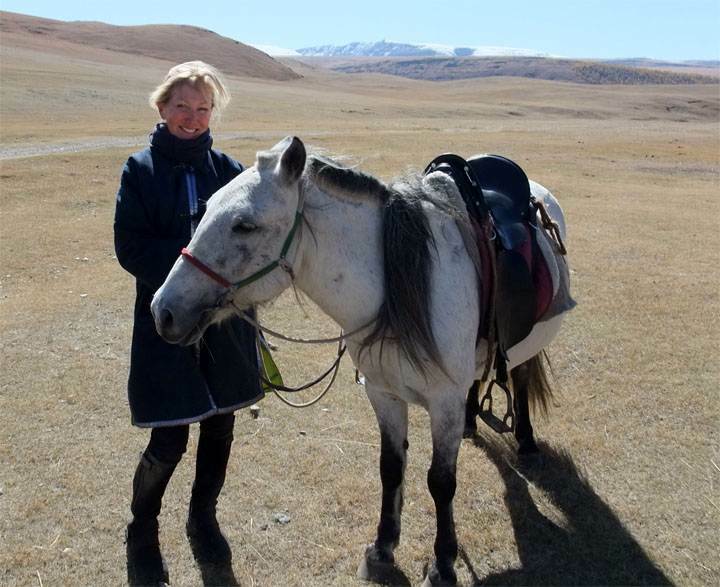 Subsequently, since 2007, Folkins has made nine trips to Mongolia, including an initial 1,100 mile equestrian journey across that country. Soon afterwards she crossed the border and began riding in modern Kazakhstan as well. Her first journey there was another thousand mile ride across the eastern portion of that nation. She is now preparing to undertake her third ride, which will take her to the far western border of Kazakhstan. 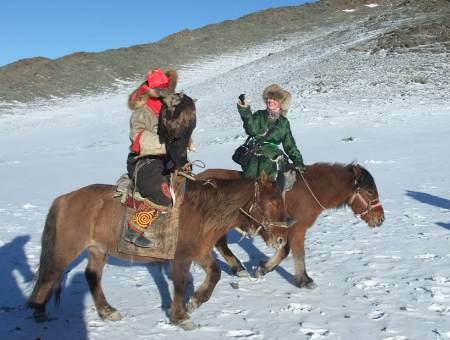 During her journeys, Folkins has made a point of riding with local Mongol and Kazakh horsemen, who then in turn become Members of the Long Riders’ Guild. Alpamis Dalaikhan, who accompanied Bonnie Folkins on her last journey, is the first Kazakh to become a Member of the Long Riders’ Guild. Some of these striking images are now being revealed in Houston, Texas, where a special show has been arranged to display images Folkins has taken of Mongolia’s Bactrian camels. The majestic beasts have two humps, are seven feet tall and often live fifty years. 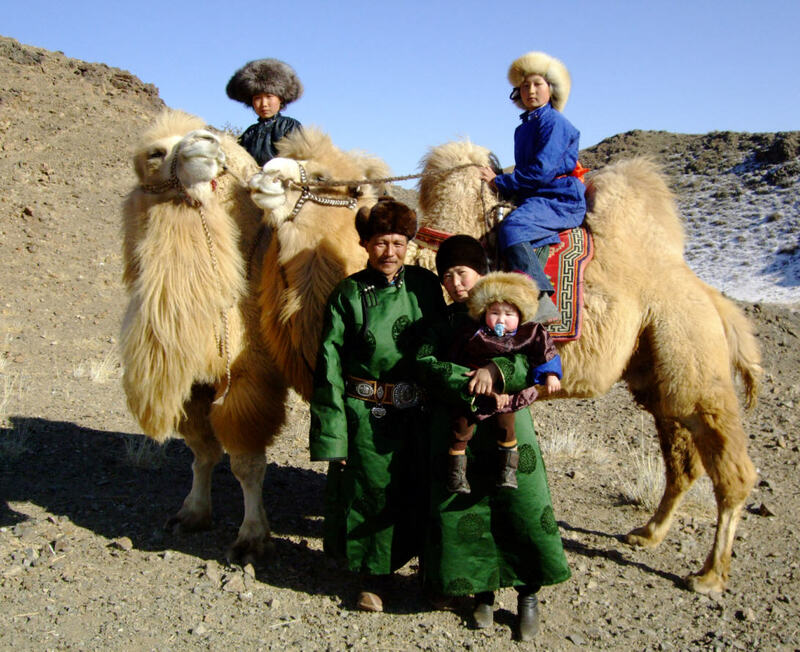 Folkins has taken stunning photos of Mongol nomads and their Bactrian camels. Capable of carrying up to 500 pounds for twenty miles a day, the domestic Bactrian camel has a wild cousin who is now in danger of becoming extinct. 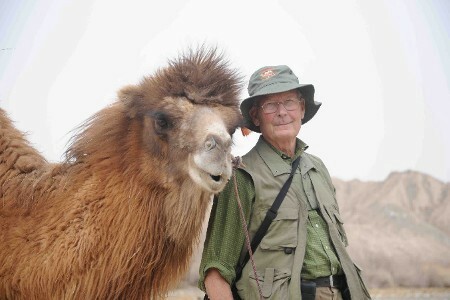 There are only a few hundred wild Bactrian camels left in Mongolia’s Gobi Desert, so to help draw attention to the urgent need to protect these rare animals, Long Rider Folkins has teamed up with John Hare, the world’s leading advocate for wild Bactrian camel preservation, the effect of which combines Folkins’ moving images with the renowned camel explorer’s first hand accounts. As this issue of the Guild’s News Bulletin goes to print, Folkins is preparing to depart for another ride across Kazakhstan. Her saddle is out. Her camera is loaded. Her route is mapped. What lies ahead, no one knows. Yet in a world where travel photographers too often focus their cameras on the world’s sorrows, Folkins has chosen instead to enact a philosophy of cinematic kindness. A private passion, a belief in the common good of others, a devotion to equestrian travel, and a blazing talent disguised under a travel-stained cloak of modesty, that’s the way to describe Long Rider photographer, Bonnie Folkins.